Saratoga Race Course is a famous horse-racing track in Saratoga Springs, New York, United States. It opened on August 3, 1863, and is the oldest organized sporting venue of any kind in the United States. John Hunter, who became the first chairman of The Jockey Club, and William R. Travers built Saratoga Race Course. The original track was built across Union Avenue from the present Saratoga Race Course, which opened the following year. Since 1864 the track has been the site of the Travers Stakes, the oldest major thoroughbred horse race in the United States, which is the main draw of the annual summer race meeting. The Saratoga meet originally consisted of only four days, but over time was lengthened, and for many years, the meet lasted for four weeks. In the 1890s/1990s it was lengthened to five weeks, and today a six-week meeting is observed, with Labor Day now being the last day of racing. From 1943 to 1945, racing was not held at Saratoga due to travel restrictions brought on by World War II; in those years, the stakes races that would have been run at Saratoga were contested at Belmont Park instead. 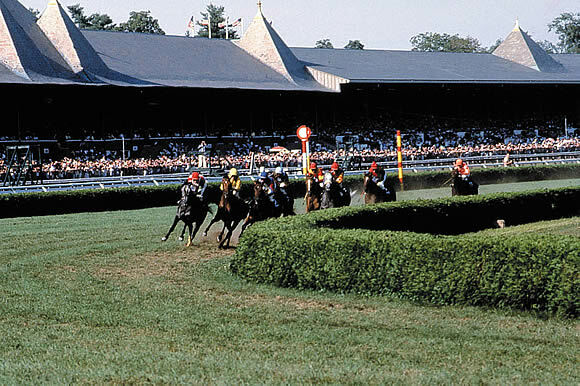 Saratoga Race Course has two well-known nicknames -- The Spa (for the nearby mineral springs), and the Graveyard of Favorites (for the upsets that have occurred there). Man o' War suffered his only defeat in 21 starts while racing at Saratoga; Secretariat was defeated at Saratoga by Onion after winning the Triple Crown; and Gallant Fox was beaten by 100-1 longshot Jim Dandy in the 1930 Travers Stakes. The track was closed on August 2, 2006 due to a heat wave which had hit the Eastern Seaboard. This was only the fourth time in the history of the track that it closed, Previously it closed for three entire seasons during World War II and in 1911 and 1912 when it was not economically viable following New York State legislation enacted by the administration of Governor Charles Evans Hughes which outlawed all forms of wagering on horse racing. As is the case with the other two tracks operated by the New York Racing Association - Aqueduct and Belmont Park - there are three separate tracks in the main course at Saratoga: a main (dirt) track, which, like that at Aqueduct, has a 1 1/8 mile (1,811 m) circumference; a 1 mile plus 98 feet long outer turf track known officially as the Mellon Turf Course, in honor of the Mellon family, whose members include prominent Thoroughbred owner/breeder Paul Mellon and his father Andrew Mellon, a former United States Treasury Secretary, and an inner turf track, the circumference of which is 26 feet (7.9 m) shorter than 7 1/2 furlongs (1,509 m). Steeplechase races are also run at Saratoga and may take place on either of the aforementioned turf courses, depending on the distance of the race. Additionally, there is the Oklahoma Track, which is about 1/3 mile from the main course, and is used for warmups and training. Oklahoma Track was the original track used for racing from 1863 until 1909, when the currently-used grandstand track was opened. A former distinctive feature of Saratoga's dirt track was the Wilson Mile chute, which branched off from the clubhouse (first) turn at a 90 degree angle. After the 1971 meeting, its use was suspended; following a brief resumption during the late 1980s and early 1990s, it was dismantled, leaving no distance available for dirt races at one mile. A similarly-designed chute is still in use at Ellis Park Racecourse, a racetrack in Kentucky, and is the only such chute of its kind that can be found at any North American track today. Saratoga Race Course is rich with tradition. A lake in the middle of the track contains a canoe that is painted annually in the colors of the winning stable for that year's Travers Stakes winner. Also, prior to each race a bell is hand rung at exactly 17 minutes prior to scheduled post time for each race. A new addition in recent years has been "twilight racing", where the first race post time is at 2:45 PM. After its introduction in 2006, it was expanded to the first and last Friday of the meet. Buried at Claire Court are Fourstardave, Mourjane (IRE) and A Phenomenon. Champion filly Go For Wand, who suffered a fatal injury during the stretch run of the 1990 Breeders Cup Distaff, is buried in the Saratoga infield. The Race Course is the setting of a scene early on in the Ian Fleming James Bond novel Diamonds Are Forever where the mob he is trying to infiltrate attempt to use a fixed race to pay him for a job.